Galway edged out Tipperary 0-26 to 3-16 in a classic All-Ireland Hurling semi-final to set up a decider against holders Kilkenny on 6 September. Tipperary's Seamus Callanan ended up on the losing side despite hitting 3-9, of which 3-4 came from play. Galway led 0-13 to 1-9 at half-time and while Callanan's second goal put Tipp ahead, the Tribesmen refused to yield. 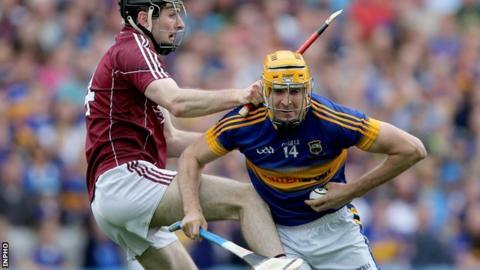 Callanan netted again on 54 to put Tipp two up but Galway fought back with Shane Maloney's point sealing victory. Tipp were ahead as the match entered injury-time but Jason Flynn then struck his fourth point from play to level before young substitute Maloney clinched victory in his first championship game for Galway in the third minute of added time. Joe Canning hit 10 of Galway's scores with Cathal Mannion contributing five points from play. Galway will be chasing their first Liam McCarthy Cup triumph since 1988 against the Cats who have won seven of the last nine All-Ireland titles. Tipperary made the better start in Sunday's game as Callanan hit 1-1 in the opening four minutes but Canning's six points helped Galway lead by a point at the break. A delightful sideline cut from Canning helped keep Galway ahead after the resumption before Callanan's second goal restored Tipperary's lead. Galway regrouped again to move back into the lead only for Callanan to ram in his third goal on 54 minutes as the Munster champions appeared to have struck a potentially key blow as they took a two-point advantage. But Galway were having none of that as they hit four unanswered points including two more from Canning. Inevitably, there were to be further twists and turns as Tipperary fought back to lead as the match entered injury-time with Noel McGrath's point putting them ahead after coming on for his first action since April following testicular cancer surgery. However, Flynn levelled in the opening seconds of added time before Canning's pass set up former minor star Maloney to fire the winner.